Argon gas isn’t always at the top of the list when you think about insulation to keep you dry and warm. But Klymit’s use of this gas makes for an incredibly warm vest that’s also lightweight. In the winter, it’s difficult for outdoor enthusiasts to lighten their load. Heavy insulated jackets, sleeping pads and other items are necessary to keep in the warmth, but often heavy or take up lots of space. But one of the newest technologies from Klymit, located in Ogden, Utah, harnesses the insulating properties of argon gas with their NobleTek insulation. Argon gas has proven to be better at trapping warmth than air. In fact, according to Klymit, a 4mm layer of argon gas has the same thermal conductivity as 14 mm of the best synthetic or natural fibers commonly used today. Furthermore, it’s lightweight, Eco-friendly, non-toxic, and non-flammable. But how do you harness a gas in a lightweight jacket or vest? We had an opportunity to test out the Klymit Amphibian vest which uses an ultralight weave fabric coated with a DWR finish. The vest features chambers that hold the argon gas, making an insulating layer between your body and the cold. We expected to encounter lots of snow and rain in the northwest for our Klymit Amphibian vest. But instead, a dry 18-degree F. winter storm gave us our only opportunity to see how well argon gas acts as an insulator. 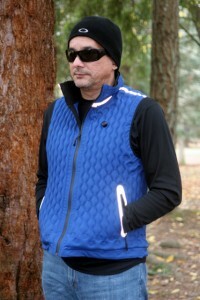 The vest is extremely lightweight and waterproof. It’s perfect for kayaking, canoeing or in any area where you may encounter lots of moisture. 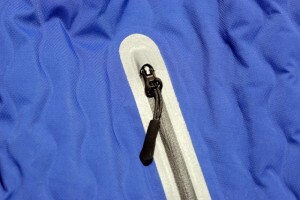 The Klymit Amphibian vest uses high quality zippers with reflective seals to keep out moisture. Zipping up the Klymit Amphibian vest, we noticed the zippers that are water tight and are reinforced with reflective seam taping. 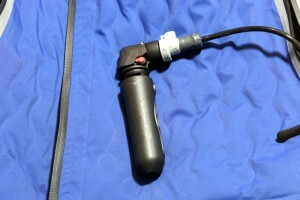 The vest comes with three small argon canisters that screw into the Klumitizer (valve) that attaches to an inflation port. We also made sure that the release valve, located on the left front of the vest, is closed. You know it’s properly closed when you turn it to the right and you hear and feel it click. A few short bursts of argon gas quickly fills the vest. The gas fills the chambers and the vest snugs in closer to your body. It’s a snug feeling that may take some getting use to by some, but once you start feeling warm you’ll begin to appreciate how the system works. In addition, the snug fit also minimizes convective heat loss and there’s even elastic draws at the bottom and top of the vest to cinch it tighter around your waist and neck if necessary. The Klymitizer fills the vest with argon gas and is easily stored in the jacket pocket. As the outdoor temperature increased, we were able to use the valve on the vest to release some of the argon gas and adjust the level of warmth; something you can’t do with other types of apparel using synthetic or natural insulation. When inflated, the vest is rather rigid. Not uncomfortable, or flexible, but when we sat down it’s rigid enough to push up from the bottom when it’s fully zipped up. Aside from this, the vest was truly comfortable and incredibly warm. We liked the fact that it’s extremely lightweight and when deflated, packs away in a small stuff sack. During our week-long trip, one canister lasted the entire duration and once inflated the Klymit Amphibian remained full for nearly two weeks before we noticed a decrease of gas in the chambers. At a retail price around $200, the Klymit Amphibian vest is affordable and great for anyone looking for a lightweight insulating outer layer that allows good freedom of arm movement. For more information, visit www.klymit.com. 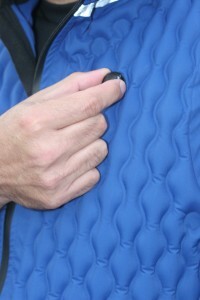 Adjusting the valve on the vest regulates the amount of argon gas insulation and thus the amount of warmth. 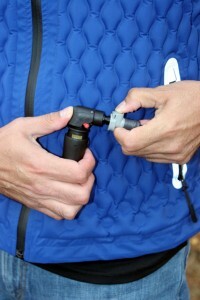 The Klymitizer easily attaches to the vest via a hose in one of the pockets. The Klimitizer also features a lock to prevent acciddental sprays of argon into the vest.